Anglian Water are currently adding sewerage facilities to the village of Croxton. As part of this work, they are advertising the closure of The Street (the main road through the village) between 22nd April and 22nd July 2013. Both NCN 13 and RCN 30 run along this road, and there is no convenient diversion for cyclists. 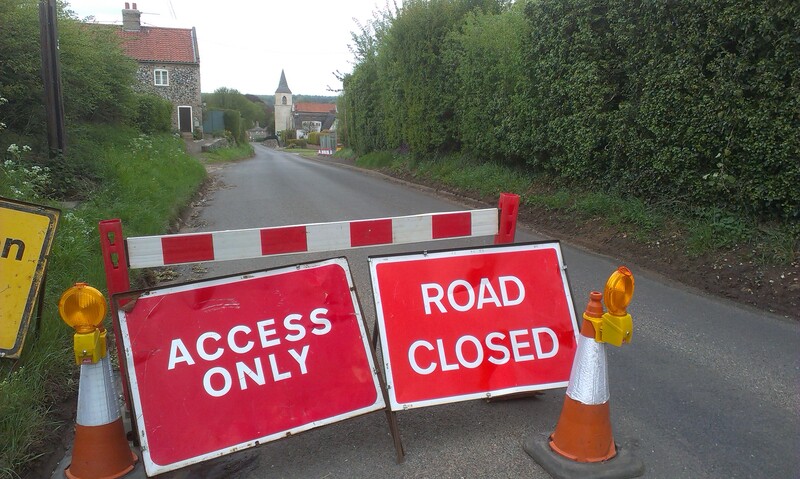 Having phoned Anglian Water to check, it turns out that the road is not necessarily completely closed, but they have to advertise a closure if their work will restrict the carriageway to less than 3.5 metres. They have to maintain access to the residential properties, so there will still be a way through for pedestrians and cyclists (and probably cars too). When I passed through on 28th April, several bits of the road had been dug up, but it was still possible to drive all the way through the village. Thus, cyclists using NCN 13 and RCN 30 should be ok to continue on the normal routes. Just ignore the “Road Closed Ahead” signs and continue through the village. I finally got out to do a route inspection today, following the recent cold weather. All the signs were still in place, so there was no work to be done. 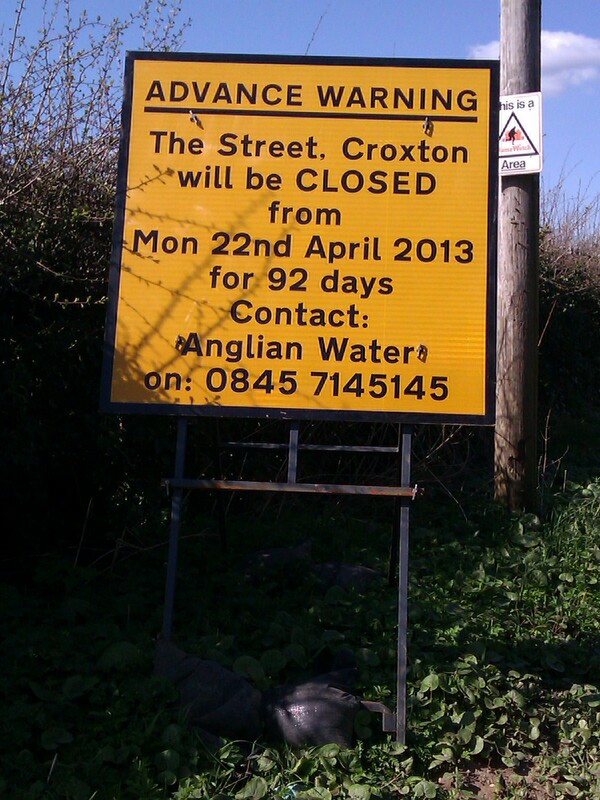 However, I did see a sign at Croxton warning that The Street would be closed from 22nd April for 92 days, for the installation of a First Time Sewerage scheme by Anglian Water. It is unclear whether cyclists will still be able to pass through during this time, so I have emailed Anglian Water to find out. Update (2013-04-28): Still no reply from Anglian Water, so I phoned them. See my next post.